Mood Saver is the first and only mobile application that uses scientific principles and well researched evaluation tools to assess your personal stress level. But it doesn't stop there, Mood Saver provides a set of activity tracking tools to help you manage your stress level. We all deal with stress and anxiety on a daily basis. Stress is essential to our success in business, sports, school and even creative and social activities. As stress levels increase, so does performance; however, when stress exceeds our ability to cope, this overload results in reduced performance, inefficiency and even physical and emotional health problems. The challenge is to understand when stress is boosting our performance, not reducing it. The stress response is a very complex physical and emotional process that cannot be evaluated with a simple questionnaire or blood test. Because stress is a dynamic process, you need to establish a baseline and then monitor changes against that baseline over time. 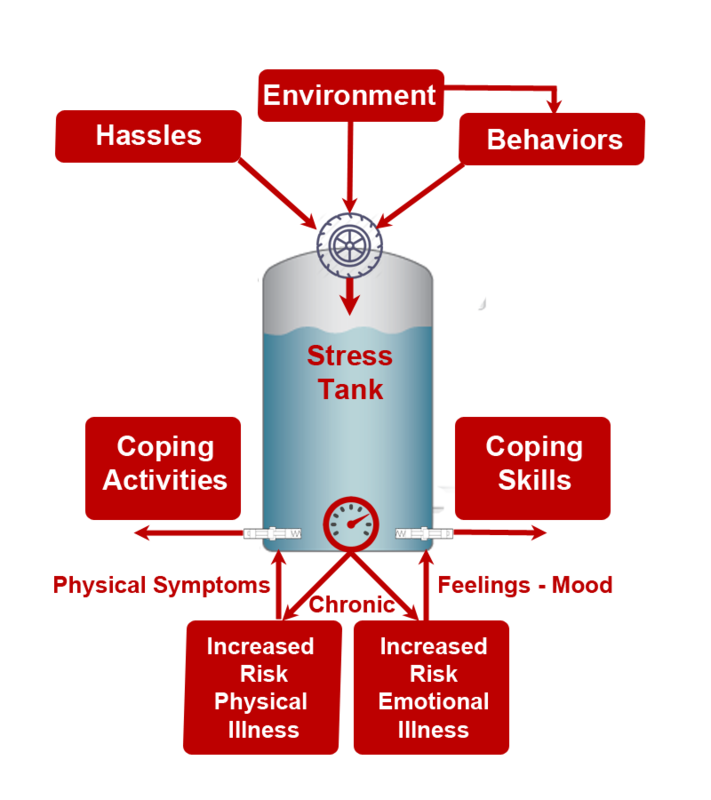 We will use the concept of a pressure tank to explain how Mood Saver measures your personal stress and anxiety. Let's look at each part of the model. At the top of the tank are a set of stressors that are continuously pumping pressure to the tank. Environmental demands and life situation are often stressful and require you to deal with various situations at home, work, and with social relationships. In addition, we develop a set of behaviors that are based on our past history as well as our environment. These behaviors often add stress to our tank. Finally, daily hassles ranging from relationships to work demands provide peaks of stress . Stress is part of our daily lives and affects how we react to our environment. At the bottom of our tank are pressure relief valves that help to remove stress. Over time we develop coping skills that help us to deal with stressful situations. Some coping skills are very helpful and release a lot of stress, while others do little to reduce stress. As long as the amount of stress that enters at the top is being reduced through adequate coping skills and activities the system is in balance and you won't notice much stress in your life, however, when stressors become demanding and you find your coping resources inadequate, you will perceive yourself to be under stress. This will trigger your natural stress response. If this occurs for a short period of time things will go back into balance with no negative impact. If high stress become extreme or chronic, it often triggers behavioral and physical responses that have been found to increase the risk for physical and psychiatric illness. Chronic stress has been linked to cardiovascular disease and diseases involving the immune system, including cancer, infectious diseases and autoimmune diseases. Extended periods of extreme stress have also been linked to anxiety and depression disorders. It is very difficult to monitor the balance of stress in your life without help. Mood Saver provides a pressure gauge that will tell you how well you are managing the stress and if you should be concerned about your personal health. The following section of this tour will show you how Mood Saver collects information and provides the information you need to manage your Stress Tank.